The Eye Doctor Allergy is a naturally effective treatment to soothe a range of eye conditions. Enjoy instant cooling relief to the eyelids and surrounding area while reducing any inflammation and swelling. 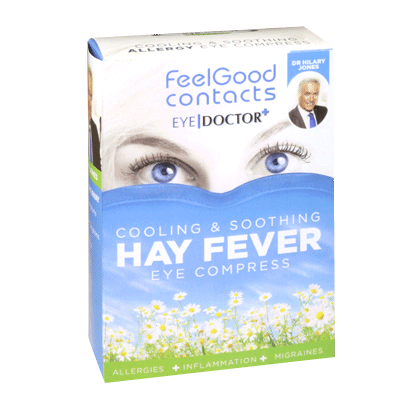 This is an ideal and beneficial solution for anyone who experiences external eyelid discomfort from eye allergies. To use, simply leave the Allergy compress in the bag provided and place in the fridge for at least two hours. Then take out the compress from the bag and insert into the cover. Place in cold water and squeeze off any excess water before applying to closed eyes. For added convenience, the compress has an adjustable strap for comfort. Minimise the symptoms of your allergies with The Eye Doctor Allergy for a simple, effective and reusable solution to meet your eye care needs. Just what I need after a day out. Eyes get really sore during the Spring, the mask is really soothing.